A lot of changes going on here with the blog behind the scenes (not that anyone really cares). I found a WordPress theme that I really like called Casper, but unfortunately the new theme has sort of broken a lot of my old posts. 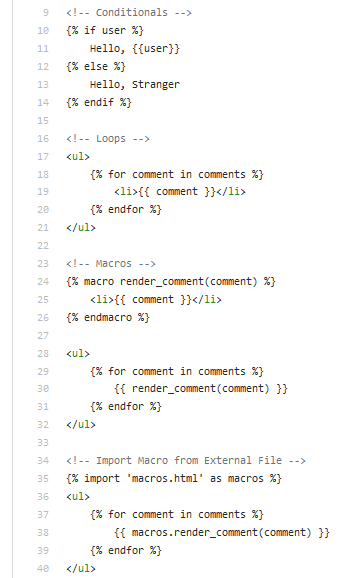 The content is all still there, but there are just little goofy doodads around my various computer programming code snippets. The whole point of this blog is to publish programming related content so I’m working hard to get setup to where I can easily post little programming tutorials with snippets of code and whatnot. I suppose done is better than perfect so I’ll be sticking with the new theme for now despite the small bugs related to my old posts. Also, I plan on checking out some cool WordPress plugins to make it easier to share code here on the blog. Coming Soon! Just wanted to bookmark a great tutorial on: Creating a Web App From Scratch Using Python Flask and MySQL. Coming from a LAMP Stack background, I’d really like to keep using MySQL, so that’s what I plan on playing around with over the next couple days. Learning Python/Flask is coming along fairly well, and I think I’m almost to the point where I can actually start building some stuff. FURTHERMORE (3/21/2019): There appear to be multiple python/mysql libraries, so I might check some of those out as well. Right now the demo app only shows how to INSERT data into the database. However, I will make sure to improve the demo tomorrow so that it also shows how to SELECT data from the database and then display the data using a Jinja2 template. LAST UPDATE (3/22/2019): Finished adding some code to the example app which demonstrates how to SELECT data from a MySQL database using Python (and Flask) and then present that data back to the user using the Jinja2 templating engine. Over the past few previous posts here on the blog I’ve been talking about Python & Flask and how I sort of got stuck today on Chapter 4 of an O’Reilly book on Flask when the author decided to throw in a 3rd party library for handling basic networking that ended up throwing me off (along with a few other choices the author made). Well… I’ve finally figured out what I’m doing and figured out how to handle basic networking in Python using Flask the way *I want to do things*. Just sort of wanted to vent here for a minute… I’m working out of Miguel Grinberg’s Flask Web Development (2nd Edition) trying to teach myself Flask and I’m really frustrated: I’m only on Chapter 4 and this guy has already thrown in Bootstrap and another 3rd party library (Flask-WTF) and the examples are quickly growing in complexity to the point where I’m having trouble following along. I wish authors would just keep things as simple as possible. There’s no need to use every feature, and every library, when writing a programming book or tutorial. Programming is complicated enough. O well I suppose. I got a lot out of the first three chapters, but it looks like I’m going to have to move on to another book to keep learning. Tossing in this Flask-WTF library and using the ‘extends’ and ‘block’ features in the Jinja2 templates just makes it too confusing as a complete beginner. I’m sure that the ‘extends’ and ‘block’ features are nice to have, but they aren’t appropriate this early in a programming tutorial. Just demonstrate how to do something in its most simplest form. TAKEAWAY: Read all the programming books on a given subject. Take what you can from each book, and move on to the next when necessary. # A Bit confusing eh? Spent my day off today diving into Django and have found myself quite frustrated with the whole thing. Working through the official Django quick-start tutorial I keep finding myself thinking: How complicated does “hello, world” have to be? I’ve often heard neckbeards on the internet proclaim you “can’t judge something by it’s hello, world.” I call B.S. Judge languages and frameworks by how difficult it is to go from zero to hello, world. If the authors of a language or framework make your life miserable getting to hello, world, you can count on the fact that they aren’t going to make anything else any easier. Coming from PHP I know that I am spoiled. Nothing is easier than going from zero to hello, world with PHP! Unfortunately for my latest project I need to either use Python, Ruby, or Node.js. So it looks like I’m going to go ahead and give Flask a try. I will make sure to write up another post about Flask if I end up liking it, or if I find something else wonderful I’ll go ahead and post about that instead. Stay tuned! UPDATE: I got the Flask “hello, world” all up and running following along with Miguel Grinberg’s Flask Web Development (2nd Edition) from O’Reilly and found it much easier to wrap my head around how everything works compared to Django. Simplicity is of great importance to me, so I think I’ve made the right choice. If you happened to stumble upon this blog post by searching for “Django vs. Flask” or something along those lines, I think you’ll find Flask the better option if you prefer keeping things as simple as possible. I’ve been trying to teach myself a little Django here over the past few days for a new side project I’m working on that requires Python instead of my usual goto language PHP. I was attempting to run Django 1.11.11 on my Windows machine running Python 3.7.1 and ran into the following error (SyntaxError: Generator expression must be parenthesized) when attempting to run the built-in Django development server. According to one StackOverflow post the problem is that Django 1.11.11 isn’t compatible with Python 3.7.1. If you happened to have stumbled upon this blog post searching for an answer to this error message, I suggest uninstalling Django and reinstalling the latest version of Django 1 which happens to be Django 1.11.20 (NOT 1.11.11), or simply upgrade to Django 2. Personally, I was attempting to run Django 1.11.11 because that is the version of Django that comes with the DigitalOcean Django server droplet image. Going forward I’m going to try running 1.11.20 on my Windows machine and see how that goes, as I would prefer to stick with using DigitalOcean’s pre-configured Django server droplet images as opposed to setting everything up from scratch myself.